Last year Lynn Bartkus contacted Lynden about having a visit exchange. 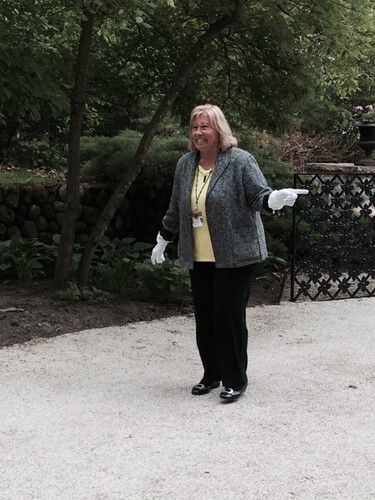 She is a docent at Ten Chimneys in Genesee Depot, the estate of Alfred Lunt and Lynn Fontanne, widely regarded as the greatest husband-and-wife acting team in the history of American theater. On May 19 I drove to Ten Chimneys for the first time, about the same distance as my home is to Lynden. On my way out, I wondered whether there would be any similarities between Ten Chimneys and Lynden. It turns out there are plenty! --The Lunts (1922) and the Bradleys (1926) married around the same time. --They both sought country retreats near Milwaukee in what were then rural areas. --Both tamed and transformed the land they bought. For the Bradleys, it was turning a farm into a pastoral landscape. For the Lunts, Lynne explained they “created a retreat for friends and family.” Lynn told me the Lunts let guests pick the breakfast tray they wanted, plus what, where, and when the meal would be served so they would feel pampered. As you can tell from the top picture, Lynn, whose mother thought Fontanne personified glamour and named Lynn after her, gave an animated two-hour tour of the sixty acres at Ten Chimneys. Lynn trained to be a docent five years ago. I told her how much I enjoyed her tour, and Lynn said she learned that people wanted to hear fun stories by shadowing other docents. A week later, on May 26, Lynn met me at Lynden in the morning. Rain was predicted, but it held off until the moment we said goodbye. It takes Lynn an hour to drive from her home to Ten Chimneys, but she does not mind the distance. She uses the time to see Wisconsin and often takes back roads. She likes that you can wander at Lynden and votes for not introducing paths. Once you have paths, she finds people tend to assume they should “Keep Off the Grass,” whether there are signs or not. Lynn has a very active Facebook presence and uses it primarily to post pictures of grandchildren for family members who don’t live nearby. Even though it sometimes seems intrusive, Lynn thinks social media invasions of privacy are here to stay. 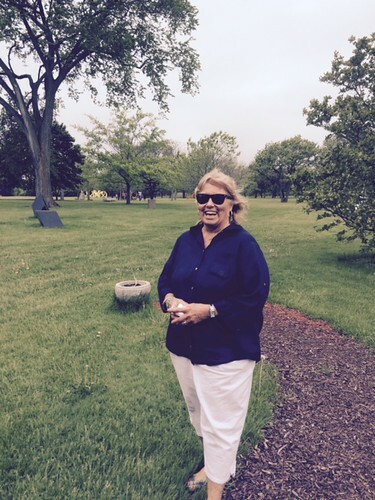 Her eight grandchildren live in Southeastern Wisconsin. She wants to bring them to Lynden. I showed her one of the sculptures children like best, George Sugarman’s Trio. “It’s like the spine of a whale,” she said. After the visit she emailed to tell me how she delighted in “the lushness, the sculptures, the pond—to relax and breathe the fresh air.” I’m so glad Lynn contacted Lynden last year. Since visiting Ten Chimneys, I find myself asking everybody if they’ve ever been there. Whether you are a theater fan or not, it’s definitely worth signing up for a tour. In the first half of its twelfth cycle, funding assistance with shipping and travel was recommended for fifteen artists. These artists--five of them past Nohl Fellows—work in a range of media and their exhibitions will take them to Fairfield, Iowa; New York, New York; Lock Haven, Pennsylvania; Austin and Dallas, Texas; Park City, Utah; Farmville, Virginia; Fish Creek and Madison, Wisconsin; and Clearmont, Wyoming. 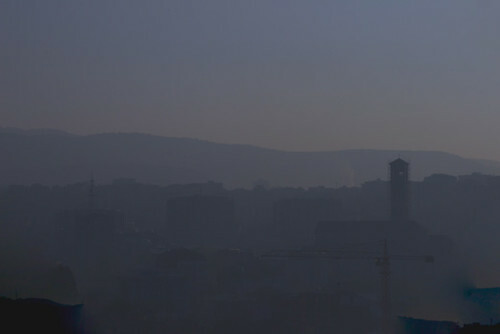 Destinations abroad include São Paulo, Brazil; Vence, France; Apples, Switzerland; and Istanbul, Turkey. Cynthia A. Brinich-Langlois is bringing work she made during previous residencies at the Ucross Foundation in Clearmont, Wyoming--a collection of handmade artist books that address the history of various cultures, settlements, and range management techniques that converge in this place--to a group exhibition at the Ucross Foundation Art Gallery. 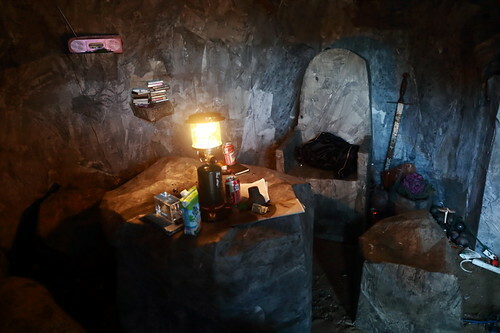 For his first solo exhibition, Jamal L. Currie will be showing video and video installation at the Clinton County Arts Council's Station Gallery in Lock Haven, Pennsylvania. 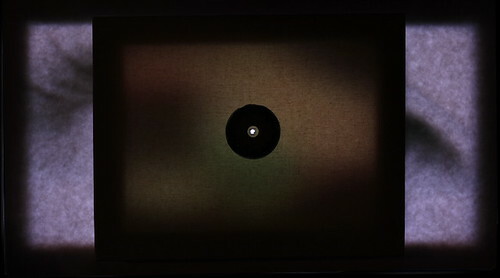 The show will include television sculptures, and single-channel and interactive video works. 2011 Nohl Fellow Richard Galling is taking part in Curbit, a three-day festival in Apples, Switzerland. Galling is designing a project as part of Lifetime Achievement, an alternative pedagogical platform based in Milwaukee. Jon Horvath joined a former Nohl Fellow in a two-person exhibition, On the Road: Hans Gindlesberger and Jon Horvath, at the Longwood Center for the Visual Arts at Longwood University in Farmville, Virginia. The exhibition featured independent and collaborative works, including excerpts from Horvath's "Passages" series: GPS drawings of Jack Kerouac text being “driven” on Wisconsin’s alphabetically labeled county highway system. 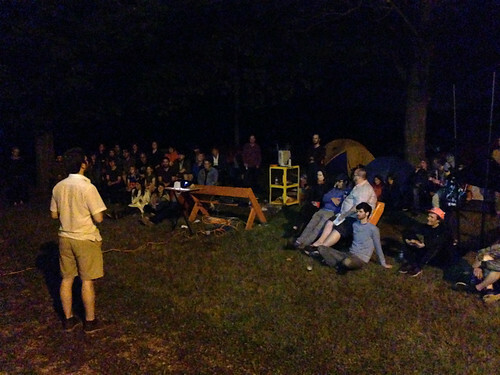 Horvath was also able to give a guest lecture at Virginia Tech and to offer critiques. 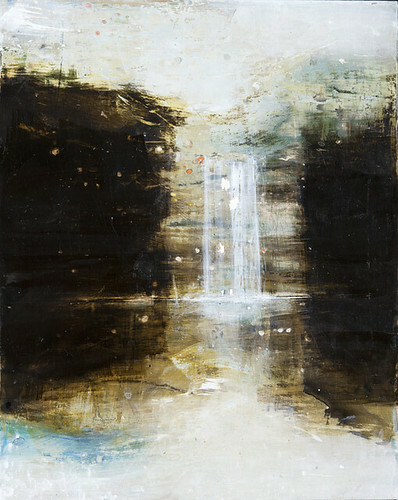 Julie Briede Ibar will have work in six group shows at the Edgewood Orchard Galleries in Fish Creek, Wisconsin, this summer. Robin Jebavy is renting a truck to transport her large-scale paintings to the ICON Gallery in Fairfield, Iowa, where she has a solo exhibition this summer. 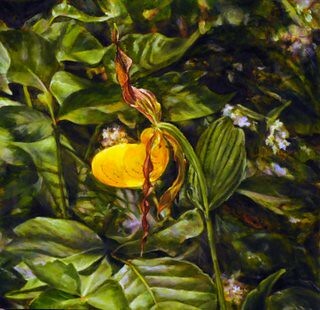 Marsha McDonald was one of three Wisconsin artists invited to participate in a Wisconsin Waterways exhibition at the James Watrous Gallery in Madison, Wisconsin. She showed a video, 100 origami canoes, moon viewing boxes and paintings. 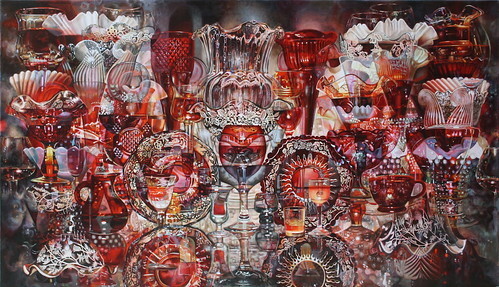 Alec Regan of American Fantasy Classics (Nohl Fellow 2011) collaborated with Homeland Security, an artist-run, non-commercial, domestic exhibition space in Dallas, Texas on an exhibition of 2- and 3-dimensional collaborative works during the Dallas Art Fair. The exhibition included the planting and dedication of a garden plot. AFC and Homeland Security see this as the beginning of a long-term collaboration between two artist-run organizations. Chris J. Robleski drove to Texas to participate in Art City Austin, a juried outdoor art fair run by Art Alliance Austin. 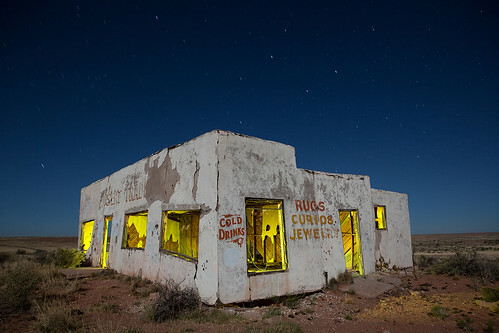 Robleski exhibited the night-time photographs he makes with "just a camera, flashlights, and no computers." Albulena Shabani is traveling to Istanbul, Turkey, to screen Trebled Times, a collection of interviews with Kosovan musicians who discuss life and music in Kosovo's recent past. Shabani will be an artist-in-residence at Halka Art Project, a non-profit independent arts organization, and in addition to screening the film, will perform original Albanian songs written while working on Trebled Times in Kosovo. 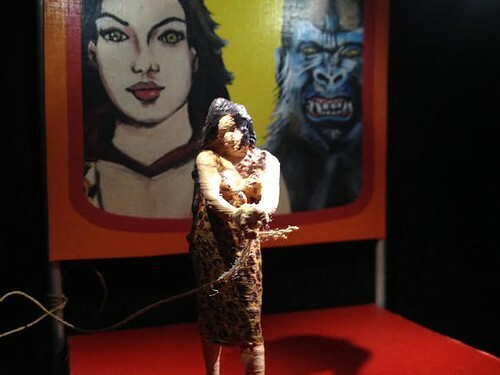 Cristina Siqueira (Nohl Fellow 2013) brought a version of the video installation she made for her Nohl exhibition, and the original artwork produced for the Monga / Ape Girl documentary poster, to Las Magrelas Bar e Bicicletaria in São Paulo, Brazil. Siquiera gave a talk as part of a “meet-the-filmmaker” night. 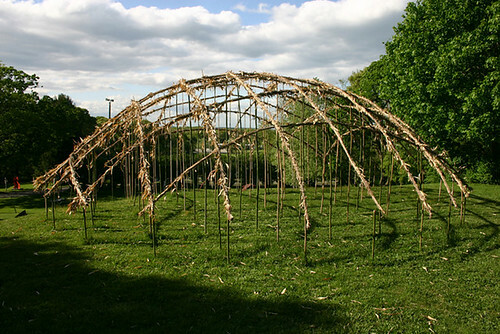 Roy Staab will make a site-specific sculpture installation from materials collected on the land for Vence-Art-Nature 2015, an outdoor festival curated by Yves Rousguisto in Vence, France. Christopher Thompson (Nohl Fellow 2010) and Michael Vollman screened The 414s at the Sundance Film Festival in Park City, Utah. The short film was purchased by CNN Films. 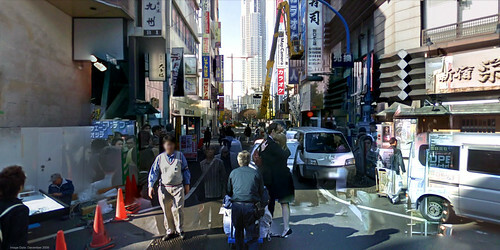 2005 Nohl Fellow Steve Wetzel traveled to New York to screen his video, From the Archives of an Inventor, as part of the Flaherty NYC series at Anthology Film Archives. This is a blog post by Pegi Christiansen, who is a Lynden artist in residence through October 2015. To learn more about her residency, Distance, click here. On April 15, eleven people sat in a circle in the upstairs Lynden studio for a Failure Round Robin. Eight of us took five to ten minutes to describe a failure and its implications. I let people know it could be any kind of failure, so I had no idea what to expect. We experienced a heartfelt ninety minutes. It was not a therapy session, though we did comfort each other. We all laughed quite a bit. Robin talked about the self-doubt, confusion, isolation, and fear she has felt getting turned down for tenure-track teaching positions. Jeanie commented, “All adjunct instructors feel like failures and second-class citizens.” Robin’s failure has led her to work even harder and drives her to be more adventurous in her studio. Chuck declared cheerfully, “I rehearse for failure on a daily basis.” Chuck is very involved in bird watching and migratory counts. Although he loves dogs, it is upsetting to him when owners, against rules posted on signs, let their dogs run off-leash in parks and preserves. He wants to be an ambassador for the bird community when he speaks with dog owners about their misbehavior. He gave examples of how he has failed in these interactions. I learned that Milwaukee is on an important migratory path that 300 bird species pass through. Sarah responded that signs always fail because no one reads them. She also finds public spaces interesting because people’s codes for them don’t line up. Sarah and Brad have discussed how artists often take the path of most resistance. “Artists want to expand a field,” said Brad. “It is experimental and you are not going to be 100% successful.” For Sarah there is also a percentages aspect to failure. Nothing is ever a total waste. Brad joked that he was “failing at being a grownup.” He confessed to wearing the same shorts every day from 2010-2012, is just now figuring out the right antiperspirant to use, and has a history of storming off job sites in a fit of childish rage. 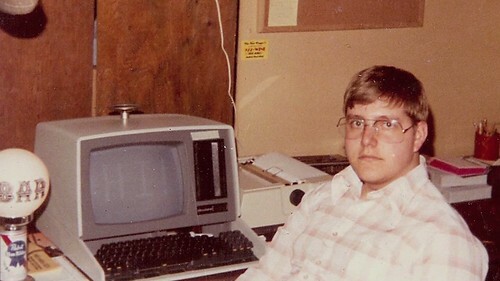 “I have professional skills, but I am not really a person yet,” he said. Anja graduated from college in 2009. It was during the recession and her friends were all unemployed, but she got her “dream job” in a puppet show. She didn’t realize, “I was expected to train for three years without any opportunity for creative expression.” She had to put on a puppet show with nursery rhymes for children every weekend. After memorizing what she was given to say and rehearsing for weeks, the head puppeteer would nitpick everything she was doing. “I felt like a pathetic idiot,” she said. Then Anja had an epiphany. She started to see the other people in training were broken and wanted someone to control them. “They were puppets!” Anja shouted with glee. Anja brought up the Western notion of reciprocity. She reminded Adam that this is another binary. Although it wasn’t therapy, I had a catharsis. I spoke about a street intersection painting project I organized. The painting was supposed to last for at least three months and wore away in four days, despite careful preparation. This occurred almost two years ago, and I still wasn’t over it. I am now. 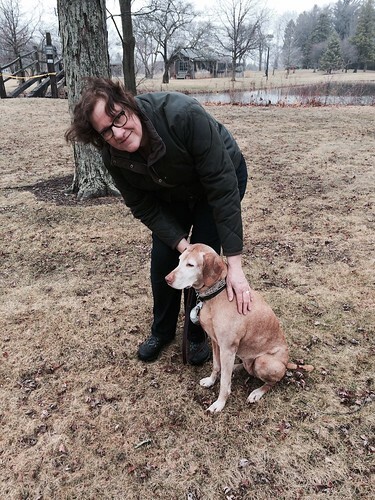 I did not confess to Bobbi Ganiere my general aversion to dogs when we arranged that she would bring Lily, one of the two dogs she and her husband Brian own, to Lynden on April 8. Bobbi and I both grew up in Shorewood and had renewed our friendship a few years before she retired at the end of last year from the Milwaukee Journal Sentinel. Lily came into the gallery with us (Editor's Note: special permission required for this! ), and her quiet and elegant bearing impressed me. As we went outside, I explained my dog disdain and asked about Bobbi’s history with dogs. Her dad had owned dogs, but it broke his heart when they died, so they didn’t have any when Bobbi was young. At a Girl Scout meeting when she was ten, Bobbi saw a litter of mutt puppies. She brought Peanut home, black and white with floppy ears. Peanut was it until Bobbi and Brian went camping with friends who owned a Vizsla. Vizslas--Hungarian, medium-sized, short haired mahogany pointers—are known for being devoted and smart. When the dog had puppies, Bobbi and Brian bought one. This was in the mid-nineties. They have always had at least one Vizsla since, and often two. Bobbi described Vizslas as “cuddly and sweet” and said she could understand my feelings for most dogs. She thinks the kind of dog matters. I had never thought about this. Maybe my attitude toward dogs was based on the breed. I was warming up to Lily by the minute. We went back inside to warm up a bit before departing. April 8 was a foggy day between two of rain, so we had been lucky, though at forty degrees it still wasn’t feeling like spring. Lily sat between us and I found myself petting her. I just don’t do this. Driving home I actually considered mentioning the idea of owning a dog to my husband Dale. This post is the fifth in a series by Junior Grounds Manager Weston Wagner tracking the behavior of wood ducks at Lynden. Read part one here, part two here, part three here, and part four here. April 23rd , 2015 – There are wood ducks hanging around the area in between the two nest boxes in the water just about every time I drive past. They still spook when they see you, but now they will only fly to the other side of the lake. With so many wood ducks present over the last couple of weeks, it would be hard to believe that at least one pair isn’t using the boxes as a nesting site. Soon I hope to sneak a peak in the nest boxes over the water to confirm that there is nesting activity happening. In other news, spring looks like it’s here to stay. There are a lot of different birds besides ducks showing up. I saw gold finches, green herons, and bluebirds today. 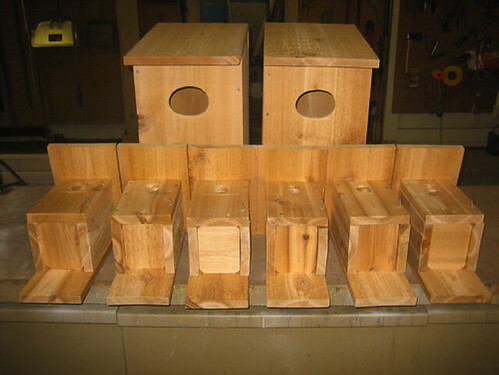 Not only did we build some brand new wood duck boxes over the winter, we also replaced all six of our bluebird houses. We went with a new style that is more similar to a wood duck box. They aren’t as big but they are much easier to monitor and clean out than the old ones. The six boxes in front are the ones we made for bluebirds. Just like wood duck boxes, predator protection is one of the most important factors in establishing a successful nest box. We added predator guards to the posts the bluebird boxes are mounted on. 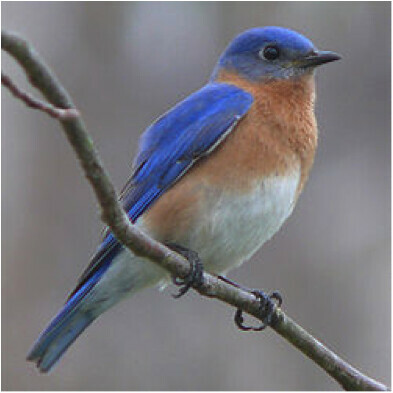 The bluebird boxes have an oval shaped hole that is sized species-specific for bluebirds. It is also important not to have a perch in front of the hole. 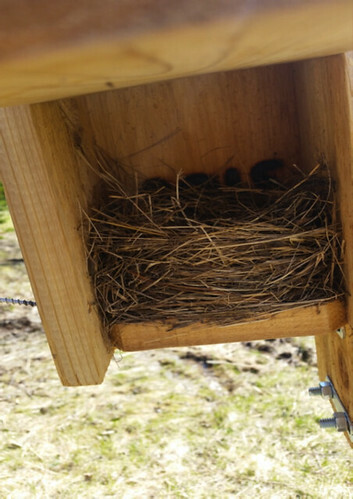 Three out of the six boxes had definite signs of bluebird activity, including one box that had a fully built nest. There were no eggs in the nest yet but that will happen soon! Notice how the nest is made only of grasses. It’s not a guarantee but there is a very strong chance that this was the work of bluebirds because the nest was made only of dried grasses and there was no lining of feathers inside the nest. Other birds will use a variety of items including sticks and feathers to build a nest. It was a cloudy, chilly morning in March when Jodi Eastberg drove me, along with five of her Alverno students, to Lynden, where we met up with eight more members of the class. The class is focused on “place,” so my questions were related to this concept. When Harry and Peg Bradley bought Lynden, it was a farm. They hired a landscape architecture firm, Langford & Moreau, known for designing golf courses to shape the cornfield into something else. 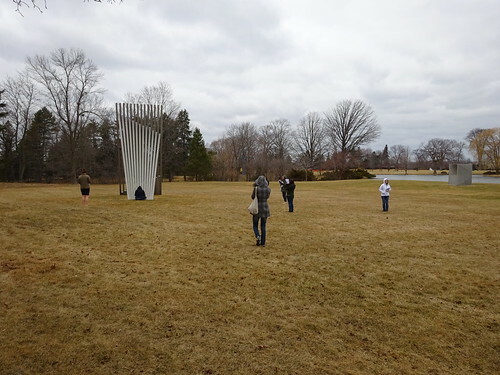 Later Peg Bradley added sculptures. 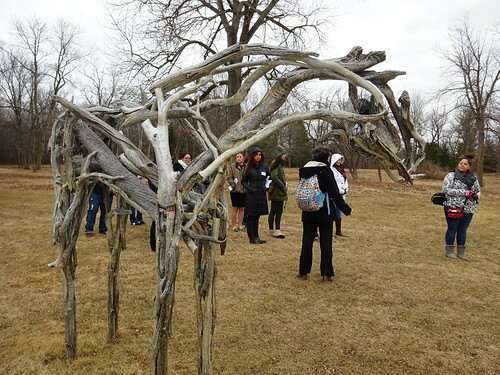 Looking out over the sculpture garden, I asked what Lynden felt like to the students. Some of the words they mentioned were open, tranquil, and family friendly. The students had read “Place,” an essay by Tim Cresswell. It made me think about the tension between globalism and regionalism. In western cultures, have places become homogenized, or are differences between places stronger? For Jessica, who grew up near Chicago, Milwaukee and Chicago seem very similar to her. They are both by Lake Michigan and, she noted, “All cities have the same street names.” Erin contrasted urban and rural spaces. She said cities have become “consumer cultures,” with people consumed with buying the newest hot thing. She would prefer to live in a rural area with more privacy and without another house visible from the windows. Lynden has been evaluating another tension. There is a beauty to Lynden having no paths, except for the service road around the exterior. Yet for those in wheelchairs or those who have trouble walking on uneven grass, it would be helpful to have paths. Executive Director Polly Morris has investigated installing paths made out of a special grass, rather than chips or concrete, which would not hinder meandering. Mariah has been to the Schlitz Audubon Center, where there are paths similar to most nature centers. Many of us are so used to paths that some of the students were not sure if it was okay to walk on the grass and waited to follow my lead. “If there was a subtle way to do it,” said Chelsey, she thought the paths Polly is considering would be a good idea. On the ride back to Alverno, Jodi mentioned the three students in the back of the van were sitting in the “best friends seat.” This led to a discussion about personal space. In different cultures more or less distance is appropriate between people who are not related. The seat in the back should have felt too close for comfort, but the three students looked cozy. This post is the fourth in a series by Junior Grounds Manager Weston Wagner tracking the behavior of wood ducks at Lynden. Read part one here, part two here, and part three here. April 6th, 2015 – There were five male wood ducks at the nest boxes this morning. The wood ducks are showing more and more activity with each passing day. 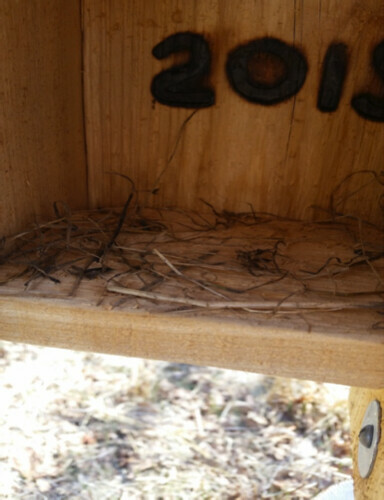 I didn’t see any females so there is a good possibility that one was occupying a nest box. I didn’t check the nest boxes over the water but I did check the ones in the field. The first box I checked had something in it, and it wasn’t a wood duck. 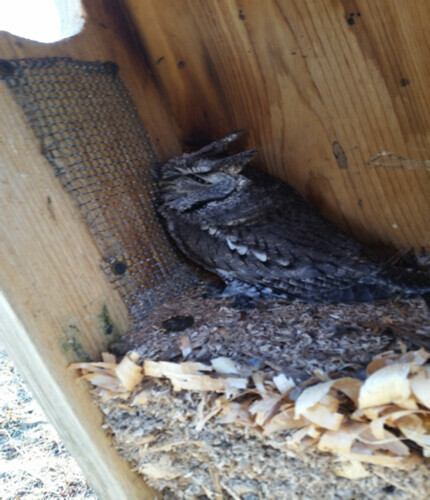 It seems as though an eastern screech owl has no problem occupying a nest box designed for a wood duck. I snapped a quick picture and left the owl alone. 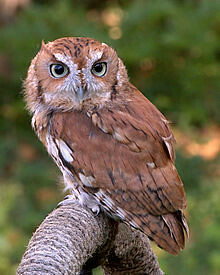 There are two color variations of eastern screech owls. This particular owl in the picture is the gray morph. My post from March 27th has a red morph eastern screech owl pictured. It’s not what we were expecting to occupy the nest boxes but we will take it. This post is the third in a series by Junior Grounds Manager Weston Wagner tracking the behavior of wood ducks at Lynden. Read part one here and part two here. April 3, 2015 – I noticed two pairs of wood ducks occupying their usual spot on the lake this morning. I have yet to capture a picture of them as they are very wary of human activity. It is possible and likely that these two pairs are the same wood ducks I have been seeing over the past couple weeks. It’s hard to tell but it is also possible that these wood ducks are the same wood ducks that have successfully nested in the boxes here at Lynden in previous years. I have yet to see a wood duck in a location other than the South East corner of the lake where two nest boxes are positioned. If these wood ducks do decide to use these boxes as nesting sites, it will be soon. My guess is they will start using the boxes, especially the ones over the water, next week, if they haven’t already. I won’t check the boxes until late next week to prevent disturbing any nesting activity. Once a nest is established, the hen will lay one egg per day until her clutch is complete. On average, the size of a clutch is usually between 10 and 14 eggs. Once the hen lays all of her eggs, she will begin the incubation process. Unlike the wood ducks, the lone male bufflehead duck I observed this morning was oblivious to my presence. 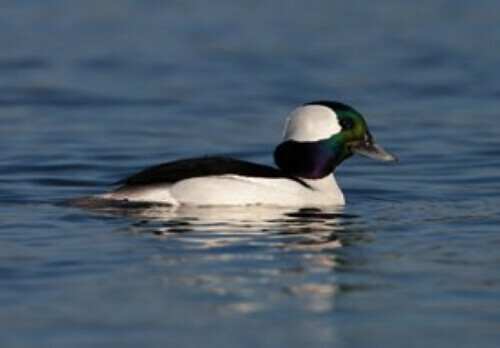 Buffleheads are a diving duck that feed underwater by catching aquatic invertebrates. One thing they do have in common with wood ducks is that they are cavity nesters. This leaves the possibility that buffleheads are checking out the nest boxes as potential nesting sites as well. This post is the second in a series by Junior Grounds Manager Weston Wagner tracking the behavior of wood ducks at Lynden. For part one, click here. 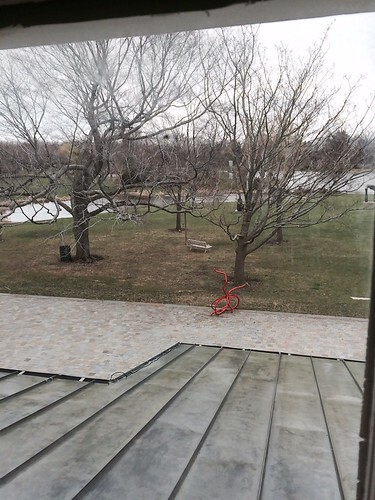 March 27, 2015 – The ice is now completely off the lake. That certainly doesn’t mean it’s warm. 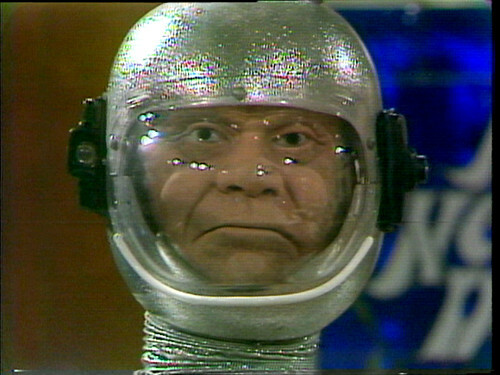 I read 20°F on the thermometer this morning. There was just enough wind blowing to prevent the lake from skimming over with ice. I checked for nesting activity in the wood duck boxes in the fields today. 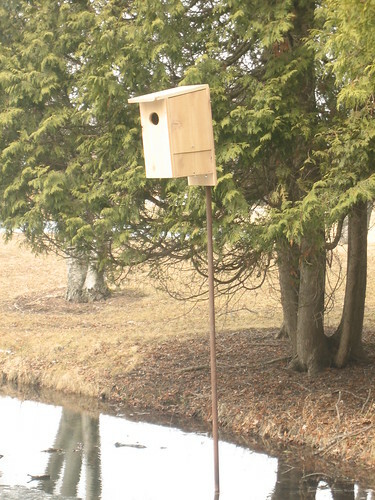 No signs of wood ducks but in one of the boxes there seemed to be some screech owl activity happening. 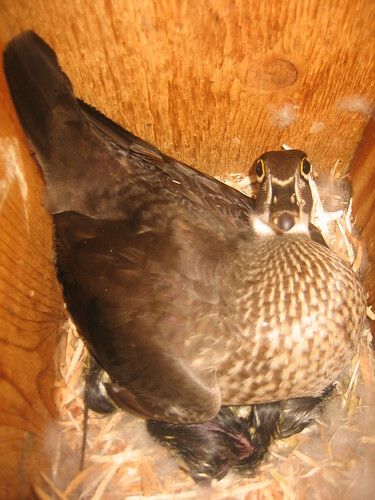 Some owls, like wood ducks, are cavity nesters and would have no problem occupying a nest box designed for a wood duck. Although no nest boxes showed signs of activity, there is still time for things to develop. Once we get some consistently warmer weather things will start unfolding as they should, and before you know it we’ll be in the full swing of things. I saw two pairs of wood ducks yesterday. Once again, they were hanging out between the two nest boxes in the water. I haven’t seen them actually put the nest boxes to use yet but it seems like they are interested in that area. Every year this is the first place they show up. I haven’t had much of a chance to observe them because wood ducks are very skittish. As soon as they see you, they take off flying. It will be important to leave any wood ducks undisturbed so they can take time to establish the boxes as nesting sites. Predator protection is one of the most important parts of installing a wood duck box. If you have predators, including humans, constantly moving around the area where potential nest sites are available, chances are wood ducks won’t feel safe and might look for other locations to nest. This is probably why the most successful wood duck boxes here at Lynden have been the ones that are over water. This post is the first in a series by Junior Grounds Manager Weston Wagner tracking the behavior of wood ducks at Lynden. March 19, 2015 - I witnessed the first pair of wood ducks of the year today. They were scoping out one of the newly installed boxes that we placed over the water. Wood ducks usually show up around the 1st of April or when the ice starts disappearing from the lake. There was just enough shore ice melted for the wood ducks to start to come and check things out for possible nesting sites. 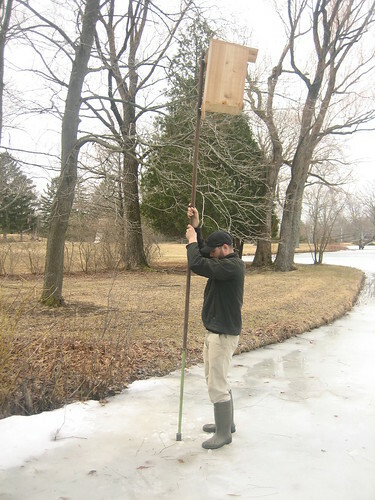 We put up the 3 wood duck boxes over the water on March 13, including an additional box at a new location. 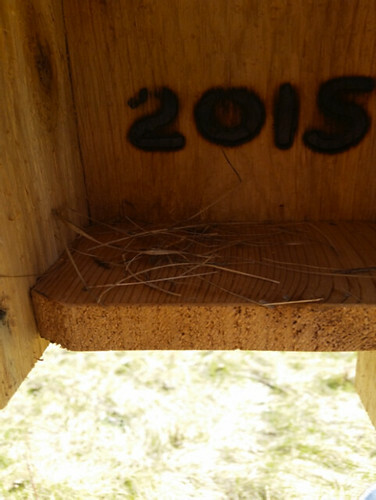 The new box is located over the water not too far from where other successful nest box sites are established. Wood ducks are not very territorial and do not fight over nesting locations. 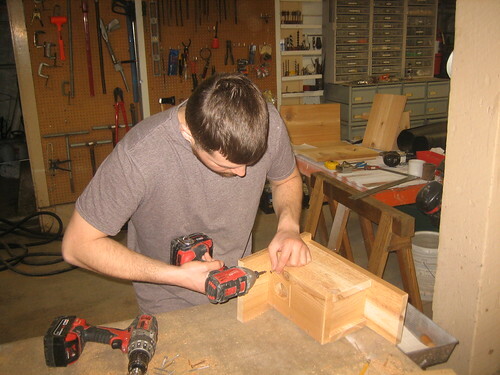 I recently attended a nest box building workshop at the UWM field station. There were a handful of very knowledgeable people hosting the event. They mentioned that wood ducks are so non-territorial that you could have two wood duck boxes mounted back to back on the same 4 x 4 post and wood ducks would possibly use both boxes as nesting sites in harmony without conflict.